Manufactured from 6mm plate and reinforced with additional bracing, the CB50 Bin is an extremely heavy duty bin for large capacity volumes. Manufactured from 6mm plate and reinforced with additional bracing, the CB50 Bin is an extremely heavy duty bin for large capacity volumes. 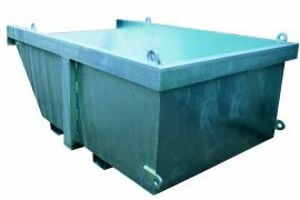 These bins allow transport of heavy waste such as sand, gravel, excavation waste and scrap metal.